This year saw the release of iPhone XS Max and the Galaxy Note 9, the two most expensive smartphones in the market. One represents the absolute best android has to offer while the other represents the absolute pinnacle of iOS. With the iPhone XS Max finally out, a comparison between the two flagships was inevitable. Popular YouTube page Phonebuff is quite famous for its smartphone speed tests and in a recent video, the popular page conducted a synthetic test of real-world app launch time. The test is conducted by a robotic arm holding a stylus to reduce any chance of human error. The speed test is not scientific like the benchmark tests, the test basically consists of opening a series of apps. This takes two rounds as the first round basically tests the processing power and software integration of the smartphone while the second round primarily tests the RAM management of the phone. 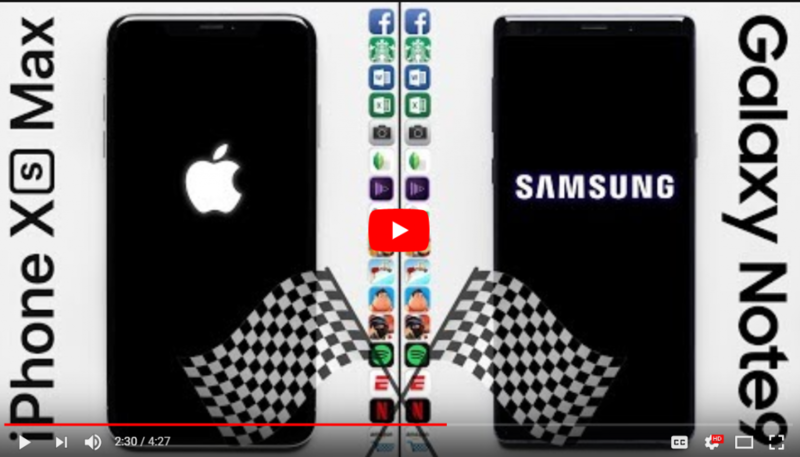 According to the speed test, the iPhone XS beat the Galaxy Note 9 by 14 seconds, as it was able to complete the first and second round in 2 minutes and 33 seconds, whereas it took the galaxy note 9, 2 minutes and 47 seconds. 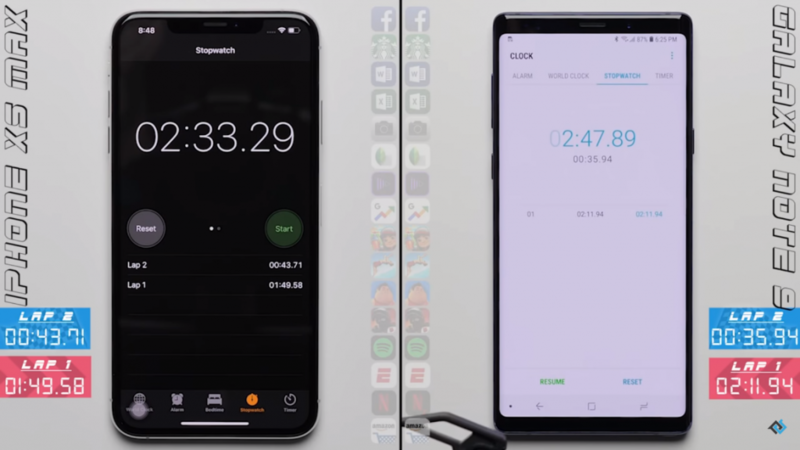 A further analysis of the tests showed that the Note 9 actually performed better in Round 2 as it took 35 seconds to reopen all the applications while it took the iPhone XS Max 43 seconds. This does not come as a surprise since the Galaxy Note 9 has 8 GB RAM compared to iPhone XS Max’s 4 GB RAM. However, Apple’s processor once again defeated Qualcomm’s Snapdragon in raw processing power. The A12 bionic chip thoroughly defeated Snapdragon 845. The applications used are day-to-day apps which are used most frequently by the users. 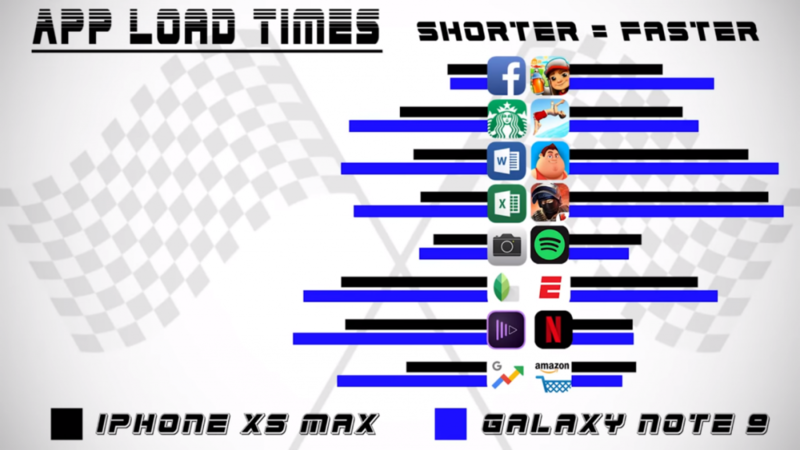 The following graphic shows the apps used along with the App load time for the speed tests.